It's a great feeling; the grass has been cut; gentle, reassuring words delivered to the spuds, shallots, rhubarb and the rest; the house is tidy and hoovered, and best of all, I've been packed since yesterday. So, I'm ready to head north this morning. 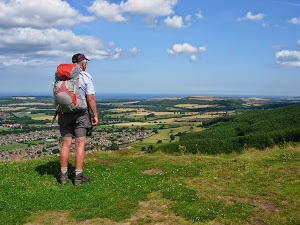 Ready too for The West Highland Way starting this weekend. It will be a walking holiday with a difference for me and almost luxurious. Reserved Bed and Breakfasts along the way except for one night at a campsite. A sherpa service to carry my belongings (less a day bag). And I'll be walking with friends for most of the time; Markus, Andrea and Anthony (all of whom I met on the Coast to Coast a couple of years ago). The weather forecast sounds good too. Mostly dry, although that may suit the midges. I'm still in two minds about a daily blog. We'll see how it goes. Hi Brian...Hope you have a great time walking on the West Highland Way - I'm sure you will. I've given up the 'daily blog' on my various trips now - I found it all a bit of a hassle and it seemed to be interfering with the enjoyment of the trip itself. I now just do a report on the trip on my return. I took your advice - sort of.